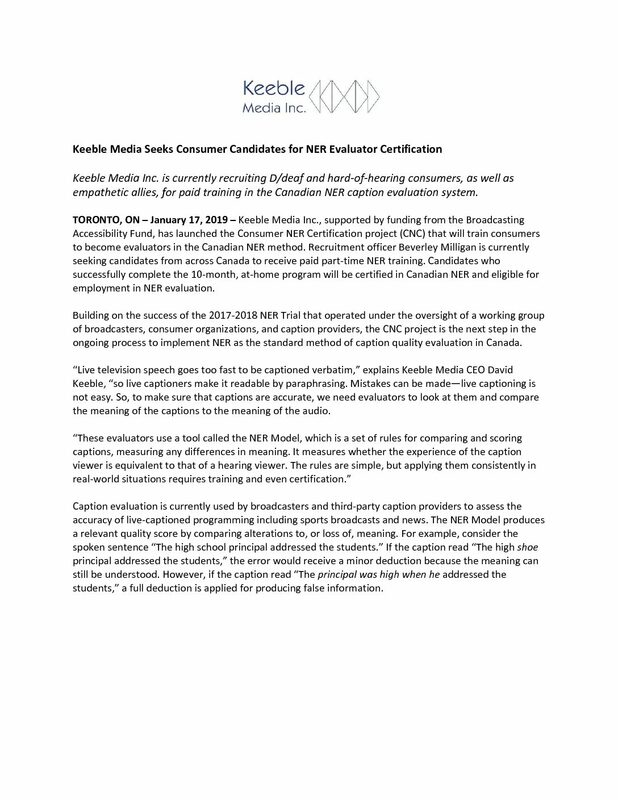 Keeble Media Inc. is currently recruiting D/deaf and hard-of-hearing consumers, as well as empathetic allies, for paid training in the Canadian NER caption evaluation system. KMI encourages interested members and affiliates of [​consumer group]​ to apply for participation in this important next step towards improving live caption quality in Canadian broadcasting. Training will include online seminars and hands-on coaching from certified NER evaluators. Payment will occur in stages and depend on successful completion of each stage of training. Individuals with strong written-English skills and an interest in caption quality in Canada should inquire about candidacy at info@pavodigital.com​. Previous Post: « Thank you to McInnes Cooper!